The Kodak Theatre opened in late 2001, the crown jewel of the giant Hollywood & Highland project, and of the Hollywood renaissance in general. It was built to be the permanent home of the annual Academy Awards show, located, as it is, right across the street from the hotel (the Hollywood Roosevelt) where the very first Oscar Night took place, and a stone's throw from the fabulous footprints at Grauman's Chinese Theatre. After years of roaming from one location to another (the Shrine, the Music Center, even Grauman's itself), the Oscars have finally come home to Hollywood to stay. And it is a dazzling home, with three balcony levels and twenty opera boxes to lend a somewhat European flourish to the surroundings. Built at a cost of $94 million, this 136,000 square foot theatre, with 3,400 seats, was custom-designed for the special needs of Oscar Night and other live TV broadcasts. 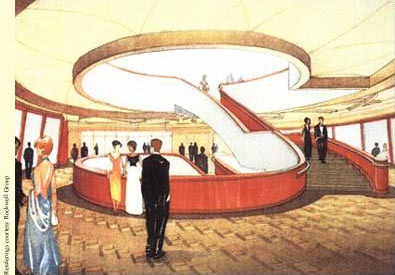 The theatre is set back from the Boulevard, so that when the stars arrive in their limos on Oscar night, they walk north through the towering entrance portal, up "Awards Walk" (past backlit glass panels etched with the titles of previous Best Pictures), and up stairs into the theatre's four-story lobby, where they will find 26 giant-size photographic images (on clear plexiglass) of Oscar winners such as Brando, Grace Kelly, Jack Nicholson and Julia Roberts. Inside the theatre, there is even a special ring of seats for Oscar nominees, next to the orchestra pit, to make it easy for the winners to reach the 120 foot wide stage. And after they give their acceptance speeches, the Oscar winners will follow the "Winners Walk," a direct path from the stage to the special press room for those post-Oscar interviews. The theatre is sponsored by the Kodak Company, which paid a record $75 million to have its name emblazoned on the new auditorium. That's certainly appropriate. Kodak has a Hollywood history of its own: the company has won eight Academy Awards over the years, and for 80 straight years (as of 2008), every single Oscar-winning movie has been produced on Kodak film. Even though the theatre was custom-designed for Oscar Night, the Motion Picture Academy doesn't own the theatre, they simply rent the facility for the Big Event. So the challenge was what to do with the theatre for the rest of the year, between Oscar Nights. Their first non-Oscar bookings were for the American Ballet Theatre's "The Nutcracker" (for the 2001 Christmas season), followed by the Broadway hit musical "The Full Monty". Over the following six years, the theatre played host to a number of events, including concerts by Celine Dion, Barbra Streisand, Prince, the Dixie Chicks, Barry Manilow, Alicia Keys, Stevie Wonder, Harry Connick, Jr., Elvis Costello, Melissa Etheridge, TV shows (such as the "American Idol" finals), and other awards shows (such as the Daytime Emmys, ESPY Awards, BET Awards, and AFI Lifetime Achievement Awards to Tom Hanks, Meryl Streep and George Lucas). But L.A. proved to be a very competitive market when it came to booking big events in between Oscar Nights. The Kodak already had to compete with existing venues such as The Gibson Amphitheatre, The Honda Center, the Greek Theatre, the Shrine, the Pantages, the Music Center, Walt Disney Hall and the Staples Center, and by 2007 it was having problems keeping the theatre filled with top acts. Then the brand new Nokia Theatre entered the picture, meaning that booking top performers would be even more difficult. In what was probably a wise move, the Kodak shifted gears in late 2007. They announced that they had signed a 10-year, $100 million deal for the ever-popular Cirque du Soleil to become a permanent tenant at the theatre. Cirque has created a brand new, Hollywood-themed show, named "IRIS", which will run year-round at the Kodak, presenting eight shows a week (except during Oscar month, of course). I went to see the show soon after it opened, in October of 2011. Click here to read my review of IRIS. For visitors who would like to see the inside of the theatre today (without paying to see IRIS), the Kodak is now offering a 30-minute guided tour. They will show you the theatre interior, let you sit where the stars sit, show you the exclusive VIP room where the stars mingle - they'll even let you see one of the Oscar statuettes won by Kodak. The public guided tours are offered seven days a week, every half hour, from 10:30 a.m. to 4:00 p.m. in the Summer, and until 2:30 p.m. the rest of the year. 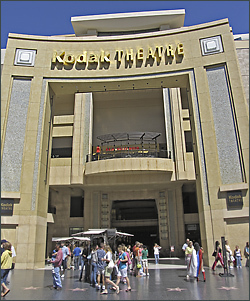 Tickets for the Kodak Theatre tours can be purchased at Kodak Theatre box office for $15 ($10 for kids). 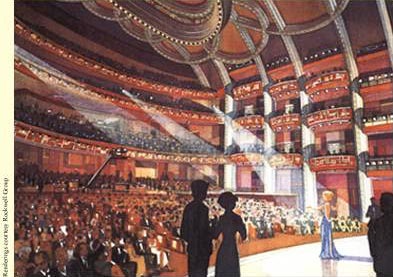 Getting there: The theatre is part of the Hollywood & Highland center, which is located on the northwest corner of Hollywood Blvd and Highland Avenue in the heart of Hollywood. It is right across the street from the El Capitan Theatre and immediately east of Grauman's Chinese Theatre.